Check your Lead/Contact orders from your Magento 2 store directly inside Freshsales. 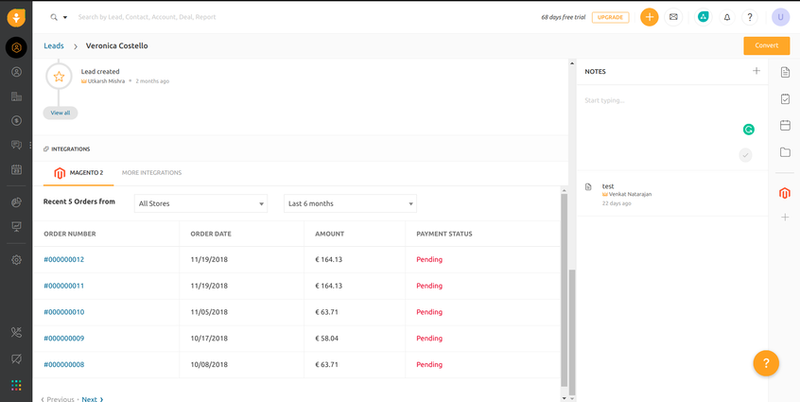 Magento 2 app for Freshsales gives you an extra edge towards your eCommerce Leads and Contacts by sharing their existing Orders directly inside Freshsales, which helps you make better sales driven decisions and recognize the potential of your customers. 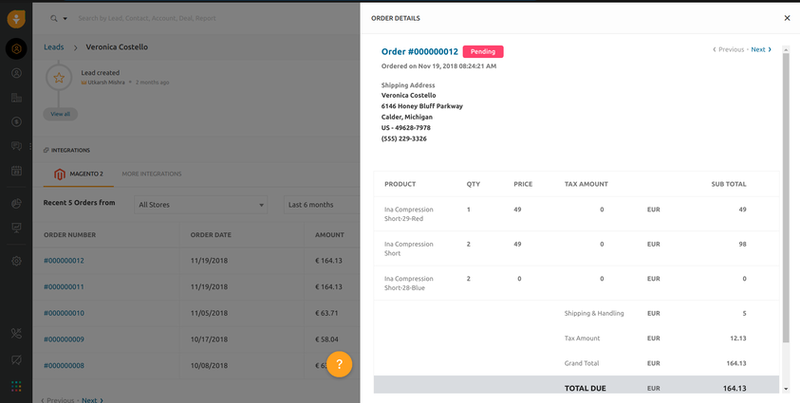 On every Lead/Contact Freshsales page, you're able to view their recent orders and specific order details to help gain more info about the connections. A new integration needs to be created inside the Magento Admin dashboard. 1. 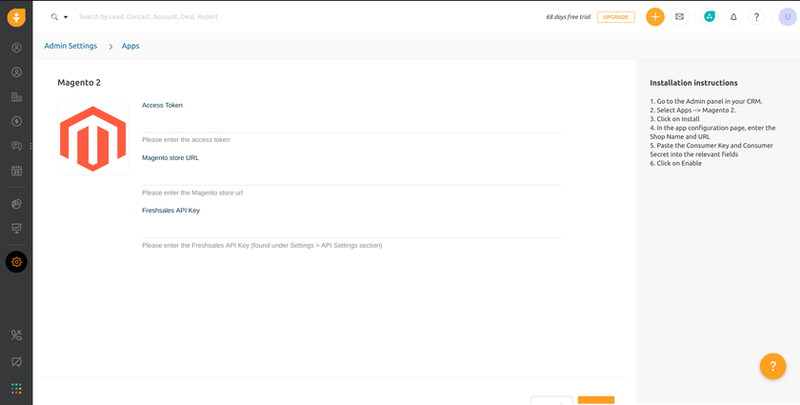 Log in to Admin and click System > Integrations to display the Integrations page. 2. Click Add New Integration to display the New Integration page. 3. Enter a unique name for the integration in the Name field. Then enter your admin password in the Your Password field. Leave all other fields blank. 4. Click the API tab. Select "Custom" in resource access. Select "Sales", "Catalog", "Customers" and "Stores" from the resources tree. 4. Click Save to save your changes and return to the Integrations page. 5. Click the Activate link in the grid that corresponds to the newly-created integration. 6. Click Allow for allowing access to presented resources. 7. You'll be presented with API tokens. Copy "Access Token" into the clipboard. 2. Select Apps --> Magento. 5. Paste the Access Token, Store URL & Freshsales API key (available under Profile Settings > API Settings, accessible from top right menu) into their relevant fields. Don't have a Freshsales account?